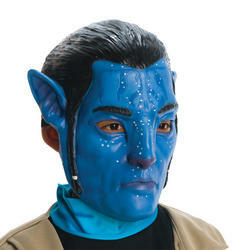 Avatar is the most successful film of all time making the colourful blue Na'vi characters instantly recognisable and a very popular choice for fancy dress costume. This Officially licensed Ladies' Neytiri fancy dress costume includes everything for transforming you into the hottest Na'vi on pandora and comprises of a flattering blue stripey jumpsuit with attached tail, brown arm gauntlets and a brown apron. You'll be woo'ing Jake Sully with ease in this amazing fancy dress costume.